After posting last week about what I suspect may be the one and only peanut butter cookie recipe I’ll need for the rest of my life, I don’t want you to think today that I’m contradicting myself by posting these cookies today. And I certainly don’t want to confuse you with too many peanut butter cookie recipes here at Smells Like Home. But these peanut butter cookies are beasts in my cookie world. 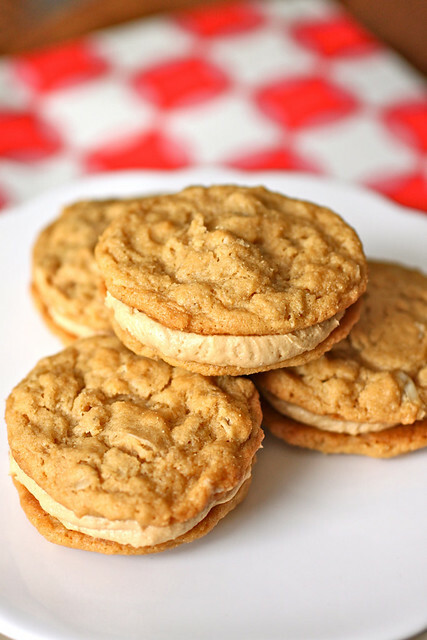 Peanut Butter Oatmeal Sandwich Cookies: where peanut butter meets oats and the two adopt a fluffy cloud of peanut butter filling into the family. A soft and chewy peanut butter oatmeal cookie reminiscent of the Girl Scouts’ Do-Si-Dos and old-school Nutter Butters, the oats add an adoringly nutty flavor to a cookie that houses two of my very favorite ingredients. And while they are soft, they also remain sturdy enough to handle the role of a sandwich cookie. We all know there’s nothing worse than sandwich cookies that crumble through your fingers and leave your hands full of frosting, especially when you’re eating them in front of other people and it’s just too embarrassing to lick the misguided frosting from your hands (just saying…). There are none of those worries involved with these cookies because the gobs of peanut butter filling are nestled safely within. I can assure you that even if you choose not to make the filling (blasphemous! ), these peanut butter oatmeal cookies are perfect on their own. The recipe only yields at 18 sandwiches so if you’re baking them for a crowd or an upcoming summer BBQ, I would at least make an extra half-batch because there’s no stopping the love people will have for these cookies – will power will play a strong role after you set them out! To make the cookies: Preheat the oven to 350˚ F. Line a baking sheet with parchment paper or a silicone baking mat. In a small bowl, combine the flour, baking soda, baking powder, and salt. Stir together with a fork to blend. In the bowl of an electric mixer fitted with the paddle attachment, cream together the butter, peanut butter and sugars on medium-high speed until light and fluffy, about 2-3 minutes. Blend in the egg and vanilla extract. Add the dry ingredients and mix on low speed just until incorporated. Stir in the oats until evenly blended. Use a small cookie dough scoop to portion out the dough (about 2 teaspoons), rolling each portion into a ball, and place them on the prepared cookie sheet, a couple inches apart. Bake about 10 minutes, rotating the sheet halfway through baking. The cookies will be light golden brown and slightly puffed. Let cool on the baking sheet 5 minutes, then transfer to a wire rack to cook completely. Repeat with the remaining dough. Once the cookies have cooled, pair them up by size. To make the filling: Combine the butter, peanut butter, confectioners’ sugar in the bowl of an electric mixer. Cream together until well combined. Mix in the heavy cream until smooth and fluffy. Use a pastry bag fitted with a plain round tip to pipe a swirl of filling onto the flat side of one cookie of each pair. Sandwich together with the remaining cookie and press down so that the filling reaches the edges. You will have enough filling to liberally fill each sandwich cookie and will likely have a little leftover which can be frozen for use at a later time (or just spooned out of the fridge for a sweet treat). Peanut butter cookie with a peanut butter filling? love! Yum! Peanut butter overload…Love it! This is incredible! YUM! I feel like I should exercise in advance of eating these!… and they would be totally worth every last calorie! Curious, because of the cream filling, how do these keep? Must you refrigerate or do they keep a couple days at room temp? Do they freeze well? So glad you love these as much as I do. They are definitely in my top 5 favorite cookies. These by far are one of my favorite cookies!! And yours look fabulous! Those look so good! I’m a lover of all things peanut butter, so I’m okay with having multiple peanut butter cookie recipes in the house! The cookes look so so good. I’ve made these at least 10 times (from Annie’s site) and they are the BEST cookies ever. People beg me to make them and even people who don’t normally like peanut butter cookies said these are the best cookies they’ve ever had. Everyone should make these!!! I have made these cookies before and I was AMAZED at how incredibly delicious they are. They are sooooo addicting and by far the best peanut butter cookie I have ever had! This is essentially diet-kill but totally worth making!